Fransje Killaars is a Dutch artist who graduated from the Rijksakademie in 1984. 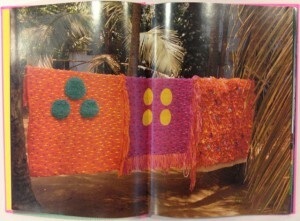 She started with a lot of paintings, but is now well known for her installations of brightly colored textiles. Both the paintings and textiles share the importance of use of color. She is fascinated by the power of color, the relationship between people and textiles and the way textiles are bound up with daily life. Her artwork is characterized by her use of fields of bright colors placed next to or on top of each other. The colors hardly ever blend together. The book was put together by Nikki Gonnissen and Thomas Widdershoven. 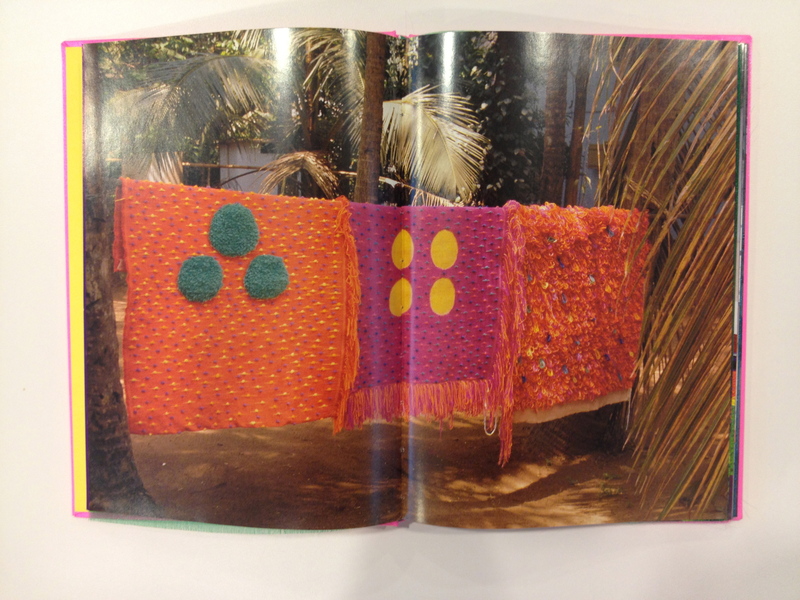 It is composed of pictures and different pieces of bright textile. 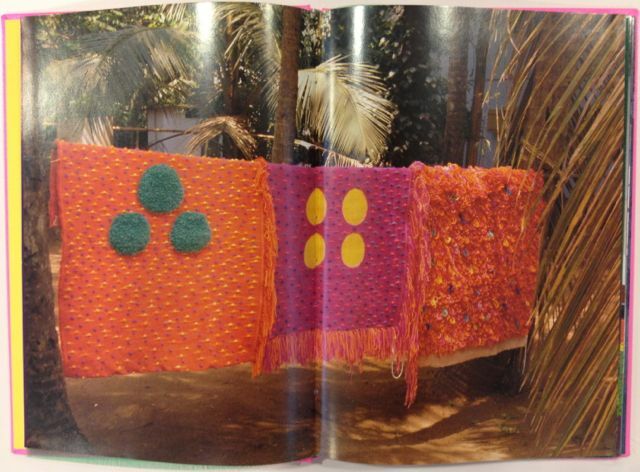 When Fransje went to India and visited the different textile workplaces the bright colors inspired her and convinced her to work more with textile. 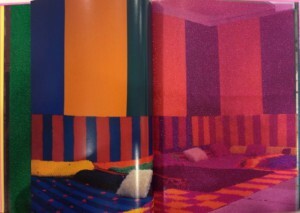 Her trip there directly lead to this work, where she filled an attic space with bright hand woven carpets. 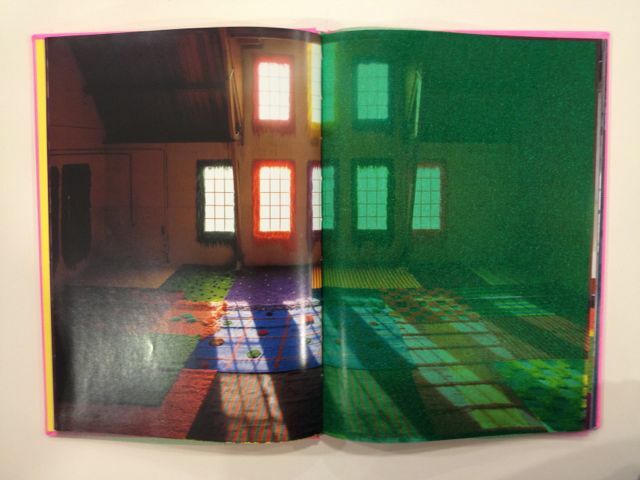 I picked this book because I was attracted by the bright colors. The format of the book brings out Fransje Killaars’ style very well. By adding a page of colored fabric in between pictures of her installations it gives the audience a sense of the touch and the brightness of the carpets in the room. The pictures in the book are also pictures of the textiles in more every day environments rather than a lot of the pictures which you see when you Google the artist. I find the pictures in a more natural environment far more interesting than in a gallery space, which I believe brings more justice to her work because she is interested in the way textiles are bound up in daily life. I personally love the physical use of color for example in everyday objects, clothing or textiles, especially bright, hard colors more than pale or pastels. I am also very attracted to the contrast between the colors, which Fransje Killaars also uses in her work. As you can see the bright shades are placed next to each other, striped or polka dotted. This emphasizes the difference and variety of the colors, rather than blending them together. This in combination with texture is even more appealing to me. Being able to hold the color and attach the sense of touch to it, moving them around and placing them next to new colors I find very exciting and this is exactly what Fransje seems to be doing in her textile works.